Results from a computer model led researchers to conclude in a new Nature Climate Change paper that global warming will cause fewer days of hail but larger hail within the remaining storms between 2041 and 2070. Authors Julian Brimelow, William Burrows and John Hanesiak don’t say what’s going to happen between 2017 and 2041, though they note that their broader findings on the relationship between human-generated warming and hail echo other studies, including one looking at 25 years of hail in France. So some of this kind of thing might be happening today. According to the scientists, the peak hail damage window will shift to earlier in the year. Drier and cooler regions will be hit with higher force, while moister and warmer areas should see less damage because global warming will cause hail to more frequently melt before it lands. (The scientists call this HALO, for “hail aloft” but melting before landing.) However, it appears that the surviving hail will have more time to grow larger because of an increased buoyancy caused by the changed climate. 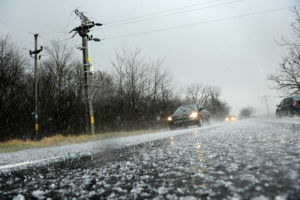 Brimelow told CNN the researchers expected less hail but thought it’d be less powerful than what their model indicated. So if you’re a young hail-chasing dent tech or insurance adjuster, expect to be spending less time in certain parts of the country in 20 years. And if you’re already encountering larger dents today, that might be why. Check out the Nature Climate Change research and maps predicting trends in hail melting before contact, hail diameter, and hail kinetic energy and see what you might find in your state over the next few decades.